The Chelyabinsk Meteor exploded over Russian skies Friday morning. The 55 foot chunk of rock injured over a 1,000 people with it’s shock wave alone. The following infographic gives a nice summary of the details with some interesting comparisons. 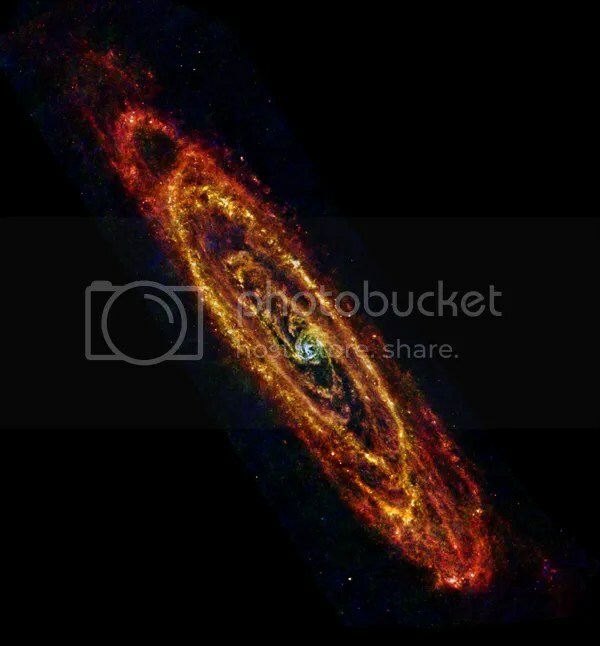 This image of Andromeda is via the Herschel Space Observatory (similar to the Hubble Space Telescope). Andromeda is the nearest major galaxy to our own, though still 2.5 million light years away. Sensitive to the far-infrared light from cool dust mixed in with the gas, Herschel seeks out clouds of gas where stars are born. The new image reveals some of the very coldest dust in the galaxy — only a few tens of degrees above absolute zero — colored red in this image. By comparison, warmer regions such as the densely populated central bulge, home to older stars, take on a blue appearance. Intricate structure is present throughout the 200,000-light-year-wide galaxy with star-formation zones organized in spiral arms and at least five concentric rings, interspersed with dark gaps where star formation is absent. Andromeda is host to several hundred billion stars. This new image of it clearly shows that many more stars will soon to spark into existence. Whenever you wonder what all that money spent on NASA amounted to, just remember Hubble. It never ceases to provide a wealth of wonderful imagery, and a reminder of just how big existence is. “The galaxy in this image, catalogued as 2MASX J09442693+0429569, marks a transitional phase in this process as young, star-forming galaxies settle to become massive, red and dead galaxies. The Hubble Space Telescope captured this image of stars in the remnants of the gas cloud that birthed them. 3 million years ago the density of the internal knots in the gas cloud, collapsed and the stars were born. While some of the stars were so massive they’ve already exploded in a supernova, the younger stars are so energized they create one of the largest clouds of hydrogen gas known. This cluster is located in the galaxy M33. View from the International Space Station as Expedition 33 begins it’s decent into Earth’s atmosphere. Expedition 33 Commander Suni Williams and flight engineers Yuri Malenchenko and Aki Hoshide landed on the steppes of Kazakhstan on November 19, 2012. Image of the Milky Way as seen from the beach at Cape Leveque, Australia was taken by amateur astronomer and photographer, Mike Selway. The bright orange star just to the right of center, sitting in the middle of the plane is Alpha Centauri. The big dark spot is a cloud of dust 30 light years across called the Coal Sack. Located a billion light years from earth this bridge composed of hot gas links two galaxy clusters. Holy Tatooine: there’s a planet with 4 suns, and two amateur astronomers found it. While binary suns planets are rare, they do exist. Scientist have found approximately 5 of them. But this discovery is the only known quadruple suns planet. Citizen scientists, Robert Gagliano and Ian Jek, have christened their find PH1. Speaking of Planets: the Keppler Space Museum has discovered an earth twin about 600 light years away. It’s located in the “Goldilocks Zone” (AKA: habital zone) of it’s star which means it’s neither too hot nor too cold for water. And water, as we all should know, means life. Scientists imaginatively dubbed this planet keppler 22-B. What a Bummer: Palaeontologists, who actually did all that nitpicky work, have determined that DNA lasts for only about 500 years (half life). So that means I’m not getting the ultimate T-rex watch dog after all. Seriously, that would have been the ultimate neighborhood crime watch, don’t you think? Attack of the Jurassic Spider: I lied; it’s really the Cruteceous Period, but this is a fantastic frozen-in-time glimpse from our prehistoric past. That’s a male wasp trapped in the spider’s web (fifteen intact strands of the web were found in the amber). Another male spider was also trapped in the same amber. “A dying star is throwing a cosmic tantrum in this combined image from NASA’s Spitzer Space Telescope and the Galaxy Evolution Explorer (GALEX), which NASA has lent to the California Institute of Technology in Pasadena. In death, the star’s dusty outer layers are unraveling into space, glowing from the intense ultraviolet radiation being pumped out by the hot stellar core. The intense ultraviolet radiation from the white dwarf heats up the expelled layers of gas, which shine brightly in the infrared. GALEX has picked out the ultraviolet light pouring out of this system, shown throughout the nebula in blue, while Spitzer has snagged the detailed infrared signature of the dust and gas in yellow A portion of the extended field beyond the nebula, which was not observed by Spitzer, is from NASA’s all-sky Wide-field Infrared Survey Explorer (WISE). The white dwarf star itself is a tiny white pinprick right at the center of the nebula.